Did you know that the National Park Service turned 102 this week? In August of 1916, there were 14 National Parks, 21 National Monuments plus Hot Springs and Casa Grande Ruin Reservations. Some were managed by the Department of the Interior, others by the War Department and yet others by the Forest Service of the Department of Agriculture. To unify leadership and administration of all these units, Congress passed the Organic Act. This established the National Park Service and brought all of these existing parks under central management. 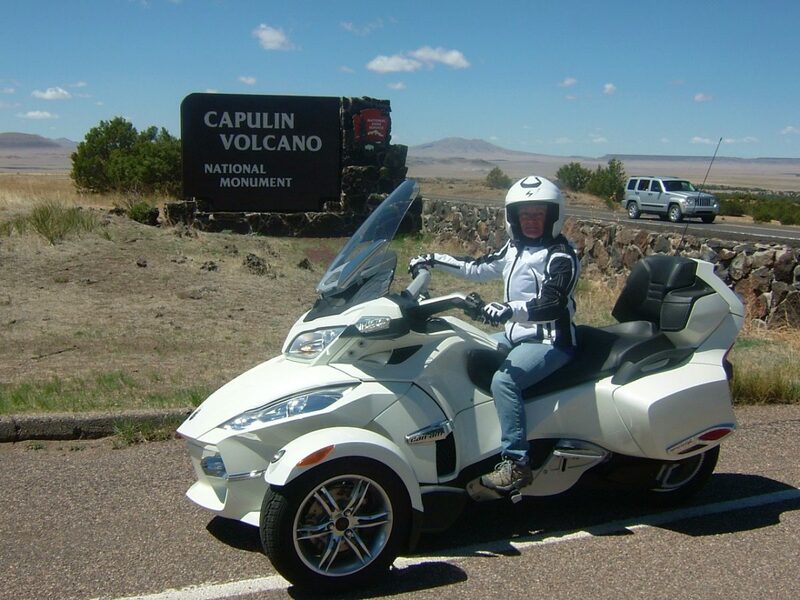 This included Capulin Volcano National Monument. 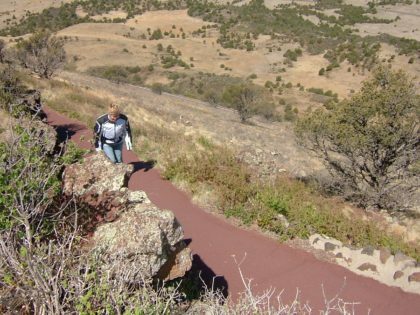 Established in August 9, 1916, Capulin Volcano National Monument preserves an example of our volcanic past. 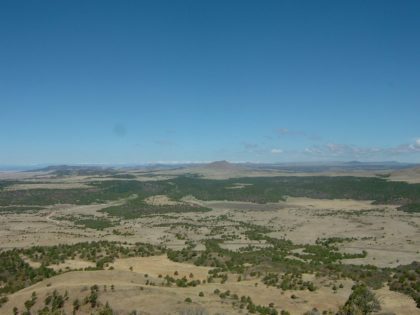 The cinder cone rises up out of the grasslands of north eastern New Mexico – reaching over 8,000 feet above sea level. Don’t worry, the last time it erupted was 50 to 60,000 years ago! 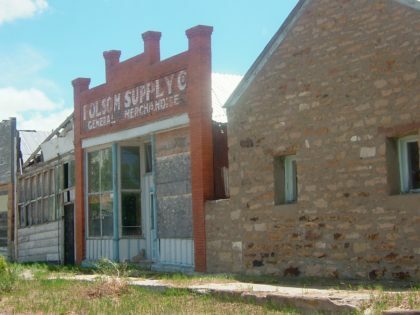 The nearest town is Folsom, New Mexico; a ghost town with a population of less than 100. Once the site of thriving stockyards, now there isn’t much to this town other than a small museum open only in the summer. The drive to Capulin Volcano makes it worth the trip. Northeastern New Mexico is gorgeous. Buttes, mesas, old volcano cones and lava flows; grassy valleys surrounded with hills of pinyon pines and juniper; and rocky canyons. 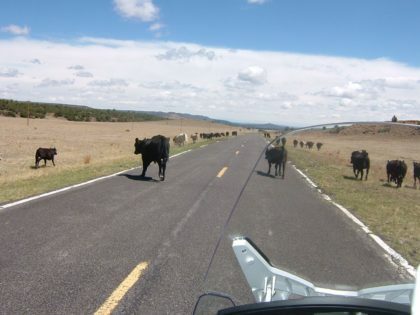 The area is primarily cattle ranches – so watch out for cows. You may also see deer, antelope, elk and wild turkeys. We took US highway 72 from Ratan, New Mexico. It is a less-travelled road and gives you a great sense of the countryside. You do have to choose the time of year that you visit. Summers are hot and dry, but in winter you can potentially get snow. Hint: If you come that way, be sure to drop by Fort Union National Monument. It is the ruins of an old fort that guarded and protected people on the Santa Fe Trail. Fun to walk around! As with other parks, start at the visitor center. They have a good movie that will help you understand more about the volcano and it’s history, plus the surrounding volcanic field. During the summer the rangers have interpretive programs. You can walk to the top of the mountain, however pedestrians (and bicycles) are only allowed on the park road when it is closed because there are no shoulders. More likely you will want to drive to the top. It’s only 2 miles but very scenic with views of the Sangre de Christo mountains. In fact, on a clear day you can see the Rocky Mountains and five states. You can also see the lava flow and remains of other volcanos. The area has over 100 recognizable former volcanos! HINT: Trailers and towed vehicles are not allowed on the road. We dropped our trailer in a small parking lot in Folsum and drove our motorcycle to the top. That was a fun ride. At one point we had to stop and let the cows cross the road! Once you get to the top, you will want to get out of the car and walk around the top of the volcano. There is a one mile loop trail that takes you around the rim. When we were there it was so windy, we felt like we were going to be blown off the top of the cinder cone! Another paved trail starting at the top takes you right down into the 400 foot crater. It’s just a quarter of a mile (easy to hike even in motorcycle boots) and it is really neat to be in the middle of a crater!!! 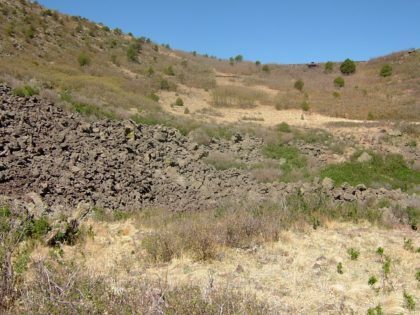 If you like to hike, there is another undeveloped trail at the base of the volcano – the Lava Flow trail – that takes you out onto the lava beds. That is pretty interesting too – but be sure to take water, especially in the hot months!